EaseUS has announced the new release of MobiMover 3.0, the third version of the free iPhone data transfer and management software. Compared to the previous version, MobiMover 3.0 has provided a more user-friendly interface and video transcoding prompt while transferring. Besides, the latest iPhone X in iOS 11 is perfectly supported by MobiMover. MobiMover 3.0 can be used to transfer files like Photos, Videos, Audios, Contacts, Notes, Messages, Calendars, Voice Mails and Safari Bookmarks & History in a cost-free way. (NEW YORK, N.Y.) — NEWS: EaseUS has announced the new release of MobiMover 3.0, the third version of the free iPhone data transfer and management software. Compared to the previous version, MobiMover 3.0 has provided a more user-friendly interface and video transcoding prompt while transferring. Besides, the latest iPhone X in iOS 11 is perfectly supported by MobiMover. MobiMover 3.0 can be used to transfer files like Photos, Videos, Audios, Contacts, Notes, Messages, Calendars, Voice Mails and Safari Bookmarks & History in a cost-free way. EaseUS MobiMover 3.0, the ultimate iPhone transfer program, is designed to import all kinds of files from PC to iPhone/iPad, export data from iPhone/iPad to PC, transfer them from one iOS device to another and manage iOS data by deleting, adding, and editing items without any quantity and size limitation. MobiMover 3.0 offers one-click data transfer feature to sync the content from old iPhone to the new iPhone X/8/8 Plus to keep all the important files from the previous device to the using ones. Contents like contacts, notes, books, Safari bookmarks, photos, videos and music, ringtones and audiobooks can all be transferred from one iOS device to another in one-click. To keep the data safe, backing up iPhone contents to the computer is indispensable. This mature iPhone data transfer software allows for exporting contacts, messages, notes, calendars, voice mails, books, Safari bookmarks & history, photos, movies, TV shows, music videos, photos videos, and audios from iPhone to computer for both space clear and data backup. To enrich the iPhone contents in a quick way and make the new iPhone more enjoyable, adding files like photos, videos, audios, contacts, notes, Safari bookmarks from a former iPhone/iPad backup or downloaded files saved on computer can help a lot. 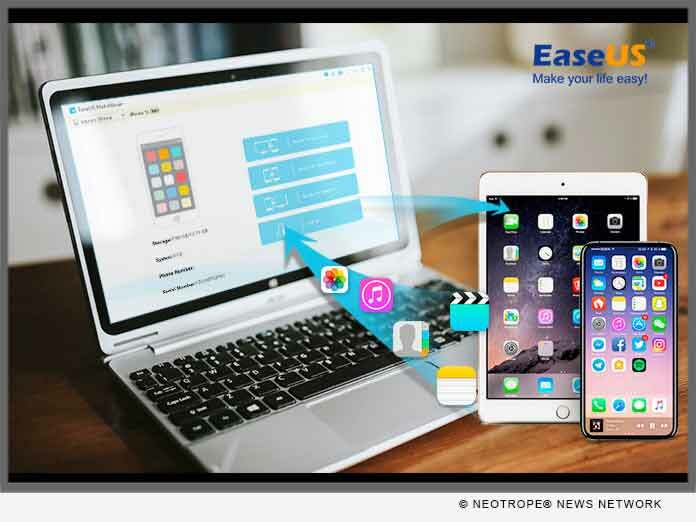 With this all-in-one iPhone transfer master, putting files to iPhone X/8/8 Plus is simple enough with only one-click. Managing iPhone content is also supported by this self-defined iPhone data transfer tool, such as deleting all contacts on iPhone at once, adding a new note to iPhone X or editing the playlists on iPhone 8 and more can be easily achieved from the computer. In brief, with MobiMover 3.0, the free iOS data transfer software, installed on PC or laptop running Windows 10/8.1/8/7, it’s quite easy and fast to transfer data between two iOS devices or between iOS device and computer. Meanwhile, comprehensive solutions for freely managing iPhone/iPad content is embedded seamlessly in this too. “iPhone(R)”, ” iPad(R)”, and “iOS(R)” are registered trademarks of Apple Inc.